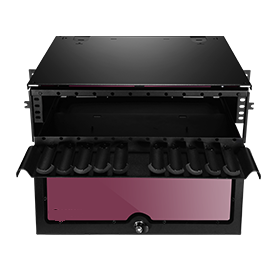 Fiber-MART high density adapter panel preloaded with fiber adapters that serves as the intermediate connection between the backbone and your patch cable, provides an affordable, compact solution for your network. Printed by wear-resistant ink holds up very well to moisture and scuffing, fast and easy identification. Quick removal and easy-to-install without requiring tools design. Metal Shrapnel designed for the adapter more firmly fixed on the panel, and avoiding the adapter fall off.